What are the Choices for Shoremaster’s Boat Cover Fabrics? Boat owners have a wide range of boat covers that they can purchase to help protect their vessels from harsh weather, sun damage or the accumulation of moisture. 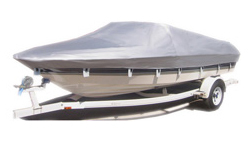 Boat cover fabrics are typically composed of polyester, acrylic or a poly-cotton blend and are manufactured by Taylor Made, Westland, Carver or Shoremaster. Shoremaster’s top-of-the-line fabric, Prism, is made from a nine-ounce polyester material. The manufacturer’s mid-range option, Sunburst, is a 6.5-ounce polyester fabric. The road tough Travel Tuff is a heavyweight 13 oz fabric. Polyester is usually a mid- to top-range material with a middling weight. Like most polyester boat covers, Shoremaster’s fabrics come with a warranty; three years for Master Duck, while the Prism and Sunburst includes a 5-year warranty. In comparison, Master Duck, the poly-cotton blend, comes with a warranty of one year. Shoremaster also offers motor hoods and room for electric bow trolling motors that can be sewn on to boat covers to ensure a snug, custom fit for your vessel. Boaters also have the choice of either draw cords or shock cords when purchasing a Shoremaster boat cover. When purchasing, it’s important to remember that tie-down straps are sold separately for Shoremaster boat covers. We are looking at many suppliers but are interested in your prism cover for our Northwood 1675 boat with console-no windsheild. we have a bow mounted trolling motor- does the cover contoured to fit this? what is the actual size of the cover. length x width.? Is there a warranty and if so what is covered? The Prism has a 5 year warranty. They are a custom fit to your boat length. When ordering tell the salesman about the trolling motor and the cover will be modified to fit it at no extra charge.